Published: Jan. 6, 2019 at 06:44 p.m.
Philadelphia Eagles quarterback Nick Foles finds tight end Dallas Goedert for a 10-yard touchdown. Published: Dec. 9, 2018 at 07:15 p.m.
Philadelphia Eagles quarterback Carson Wentz dissects the Dallas Cowboys' defense with touchdown dart to tight end Dallas Goedert. 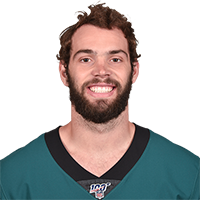 Published: Oct. 28, 2018 at 10:57 a.m.
Philadelphia Eagles tight end Dallas Goedert catches a 32-yard touchdown pass from quarterback Carson Wentz. Published: Oct. 21, 2018 at 03:16 p.m.
Philadelphia Eagles quarterback Carson Wentz rolls out and finds tight end Dallas Goedert in the back of the end zone for a touchdown.